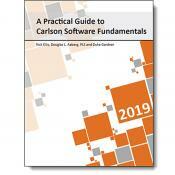 This text builds on the foundation of knowledge established in A Practical Guide to Carlson Software Fundamentals 2019. While a mastery of the material in that book is not mandatory to the successful completion of this text, it is highly recommended as a prerequisite to this courseware. 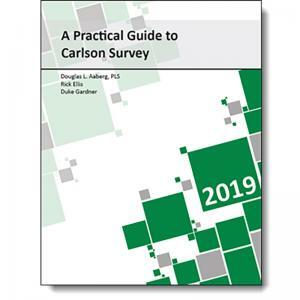 Together the set of two books totals almost 800 pages of detailed training content, including 71 lessons and 163 hands-on exercises, making them the definitive resource for learning Carlson Survey. Get the most comprehensive set of Carlson Survey training material available with our Complete Carlson Survey 2019 Training Bundle with AutoCAD. It includes our Carlson Software Fundamentals, Carlson Survey and AutoCAD 2019 books at one low price. 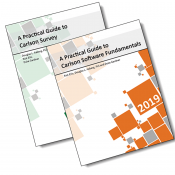 This new Carlson Survey 2019 book focuses on effectively using this powerful software, providing you with skills that other professionals are using in the workplace every day. This book has 461 pages, organized into 7 chapters, in a large-format, spiral bound volume.